Thanks to TimeHop and Facebook Memories I was reminded that on November 30, 2010, I had the most shocking experience of my lifetime. 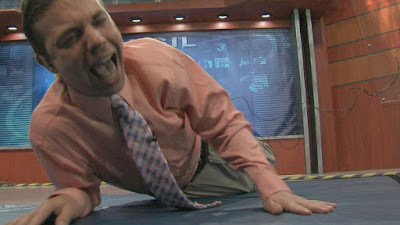 I was tased live on News 3 This Morning on WSIL-TV. To this day I still get asked questions about the experience and told by people who saw it, they laugh every time they rewatch it. So let's start at the beginning. 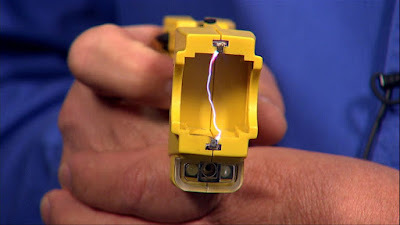 Producer Weston White (Dub Dub) had approached my co-anchor Emily Eddington and I about doing a segment on tasers to explain how and why police use the devices. Some of our colleagues had done taped segments on tasers, but this would be a much more detailed account of the use because we were live and could take as much time as we wanted. The segment would end with me on the receiving end of the jolt. I agreed and we contacted Chuck Doan who is a police training specialist. After meeting with Chuck prior to the segment, my trust in him grew and I knew that I'd be in good hands. 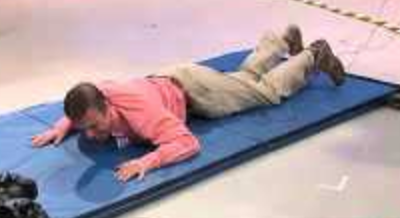 That morning Emily interviewed Chuck as I laid on a mat on the floor. He attached several clips to me and soon had the taser to Emily. Watch the video, you can tell she is not wanting to pull the trigger and my shouts of agony didn't help her anxiety during the segment. Before the zapping started, I was reminded it would last five seconds, no matter if Emily released the trigger. Five seconds does not sound like a long time, but when that much electricity is coursing through veins, it seems like an eternity. I was fearful of two things that day, peeing in my pants and cussing on live TV. I'm proud to say I did neither. I've been asked if it hurt. I don't know that painful is the right word to use. It's still hard for me to articulate the feeling it was. Imagine putting your tongue on a 9-volt battery or touching an electric fence. It's like that only much more intense and you don't get any relief like you do when you pull away immediately. After the experience, I was helped up and continued on with the rest of the newscast, which was only a few minutes. We did have a plan in place if I was not able to continue, but I'm thankful that was not the case. I'm proud of what our team did that day. We gave some really important information about tasers and we also entertained people in the process. To my knowledge, we're also the first (and only) station in this market to do a tasering live on the air. Most are recorded and the curse words bleeped out. So if you're ever in a situation where police ask you to stop what you're doing or they'll use a taser, my advice is simple. Listen. Stop what you're doing. In the real world, you'll likely be hit by a couple of barbs and the jolt will drop you to the ground. LOLOLOL...I hate to say it, but I seriously laugh out loud every.single.time I see this clip! ...which, btw, has only been 3 times this morning. Miss you, my friend.